A typical Emirati wedding, in terms of the number of wedding guests, is huge by international standards. It is not unusual for an Emirati couple to host 800 wedding guests and more, and it goes almost unsaid, that this is not a standing cocktail reception but rather a lavish seated banquet. So where do these large weddings take place in Dubai? Many of the traditional male only and female only weddings and large celebrations are held at the exhibition halls of Dubai World Trade Center. However, there are several 5-star hotels in Dubai that have huge ballrooms to cater for large weddings. From the Grand Hyatt Hotel to Atlantis The Palm, these hotels have magnificent banquet halls and offer superb service with a seamless operation creating those memorable moments sought after by couples around the world. Grand Hyatt Dubai brings together tradition, culture and a couple’s personal style to create a wedding that is both exciting and memorable. The spectacular Baniyas Event Space offers a sophisticated setting for celebrations for up to 2,500 guests. 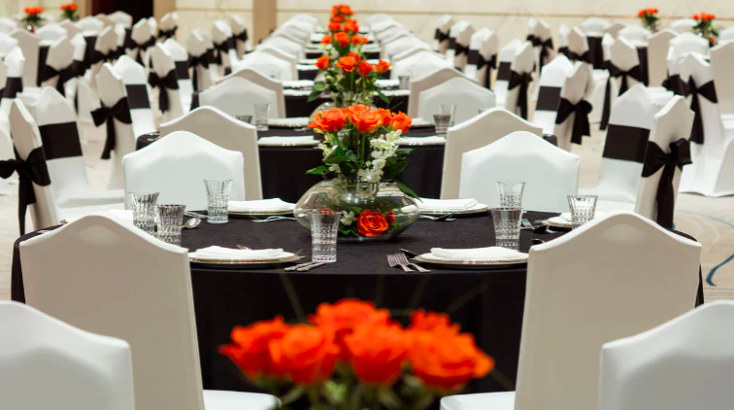 Baniyas Event Space can accommodate up to 1,650 wedding guests seated in banquet style. 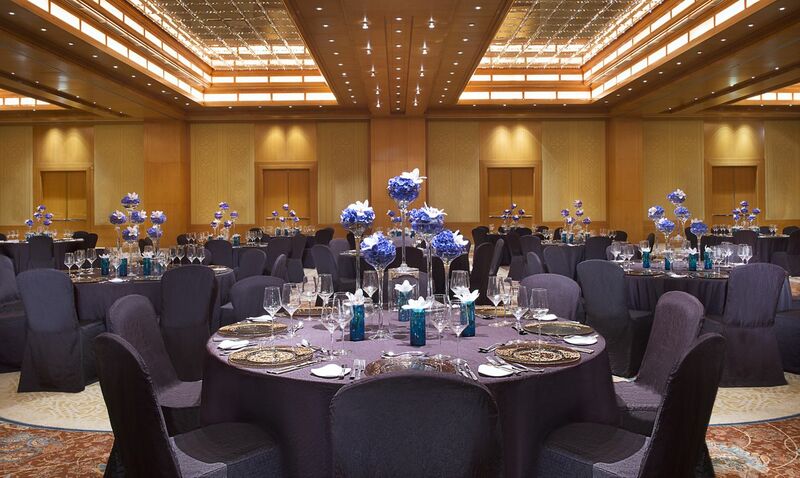 Decorated in a classic elegant style, Baniyas Event Space comprises 3,212 square meters of function space. High ceilings and stunning chandeliers can be theme controlled to create a dramatic effect in feature with fiber optic lights. The ballroom also includes 7 drop down screens and ceiling-integrated projectors. Two LED walls enhance the overall hi-tech experience with 4K resolution on 3.6m x 5.4m large screens. The sleek restaurant-style Show Kitchen is another highlight within the event space. Encased in glass, behold 612 square metres of gastronomical extravaganza with 22 live cooking stations. Local and international set menus or buffets of choice created in consultation with our culinary team will ensure that all our guests are exquisitely indulged. The event space is welcomed with two dedicated Grand Entrances separated from the hotel. The Wedding Packages include: Complimentary suite for one night (wedding night); Hotel standard 6 layers wedding cake (genuine top 2 layers); Stage pieces and drop-down screens (projector); Hotel standard table cloth and chair covers and Complimentary valet parking service. The Grand Hyatt requires a minimum guarantee number of 800 guests on weekends (Thursday and Friday) and 550 guests over weekdays (Saturday to Wednesday). 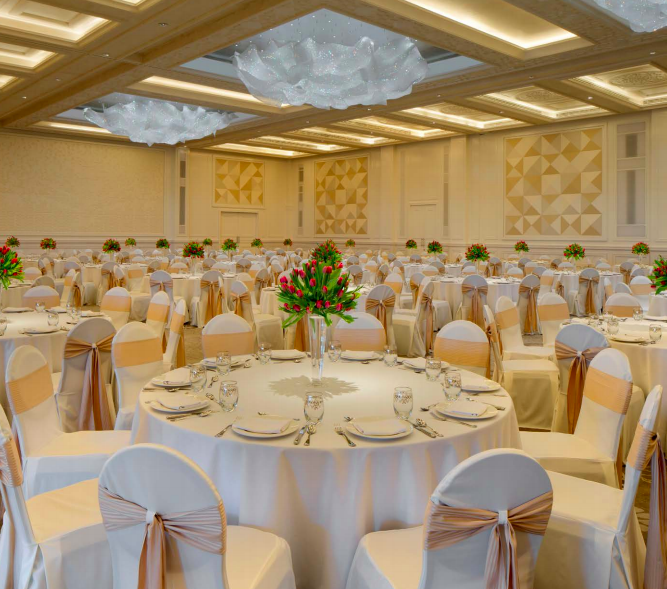 Le Méridien Dubai Hotel & Conference Centre’s 5500 square-meter banquet and conference facility is equipped to accommodate the most demanding event. 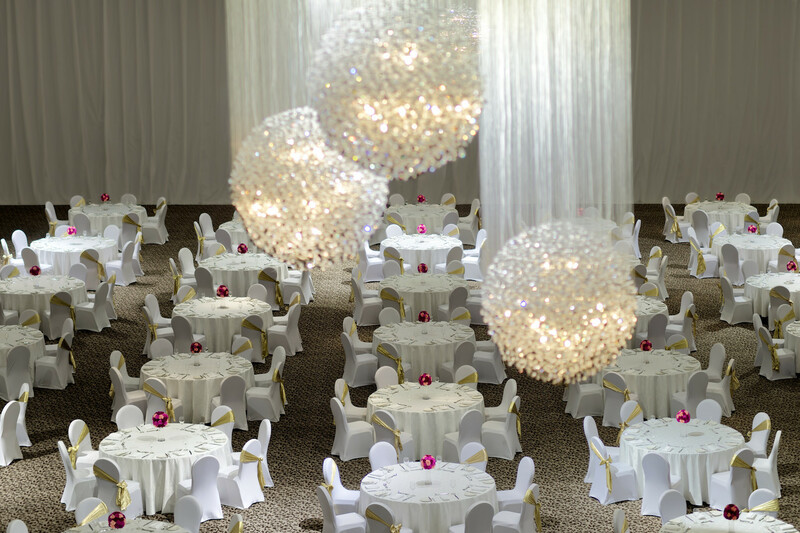 The Great Ballroom which is 1515 square meters can accommodate 1300 wedding guests seated in banquet style. The hotel's Events Hub will plan every detail of your wedding, from the artistically carved cake to the elegant decoration that bestows this majestic ballroom. The attentive and efficient team brings together the ideas that make every detail flawless and delivers a memorable experience. The Wedding packages include: Dedicated wedding planner; Complimentary food trial for up to 4 persons; Multi-tier customized wedding cake; Bridal Suite with direct access to the Ballrooms; A complimentary one night stay in the prestigious Royal Club; Complimentary lavish breakfast served in the Bridal Suite; 50% off on food & 15% off on beverage at any of the restaurants during your stay; Dedicated Lounge and Majlis; A special children’s area with the latest in television technology and audio system; Direct and dedicated entrance into the ballrooms from the car parks; Self or valet car park services; Spacious and glamorous pre-function areas; complimentary high speed WiFi; Red carpet entrance; Basic stage and dance Floor Set up; Superior linens to match your wedding theme (overlays, chair covers and bows on the chairs); Background music and microphone to get you started; Multicolored LED lightings in the ballroom to set the perfect mood and ambience; and A complimentary drop off to your choice of destination - your home in Dubai or Dubai International Airport. Atlantis The Palm is an iconic destination in Dubai, the majestic 5 star hotel situated on Palm Jumeirah; a man-made island that has captured the world’s imagination with its magnificent scale and ingenuity. From the hotel architecture to the award-winning restaurants and must-visit aquatic attractions, this is one of Dubai’s luxury resorts that never ceases to amaze. The Atlantis Ballroom can accommodate weddings and gala dinners for up to 2,500 guests cocktail style or 1200 seated wedding guests. With 8 meter high ceilings and direct access to the impressive Royal Terrace. Personalised service, meticulous attention to detail and cutting edge creative design are the trademark of The Atlantis, which launched an exclusive Wedding Lounge on 1 May 2018. Read more on this: Atlantis The Palm Launches Wedding Lounge. 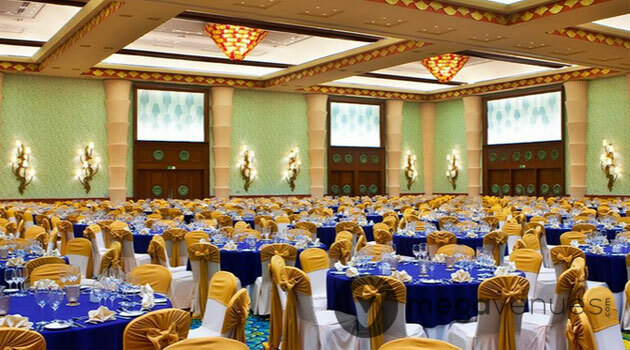 The Grand Rashidiya Ballroom of Roda Al Buston Hotel has a total area of over 1,500 square meters which can seat up to 1000 wedding guests (in banquet style) and host 1,800 guests for a cocktail reception. Once in a lifetime occasions command a venue that wows guests, service that surpasses expectations and a team that can turn a wedding celebration into an unforgettable event with memories that last forever, this is what At Roda Al Bustan Dubai promises and delivers. Their experienced team of wedding specialists can help personalise every detail to turn your vision into a reality. The JW Marriott Marquis Dubai is a superb wedding venue with luxurious accommodation and an incredible choice of cuisines from around the world, this is a wedding venue that takes romance to new heights. With spectacular indoor and outdoor locations, JW Marriott Marquis Dubai will create memories that will last a lifetime. Whether it’s an intimate gathering for a select few, or a grand celebration for 1,300 guests or more, intuitive service, personal touches and culinary flair will take your wedding celebrations to a whole new level. Its Dubai Ballroom, nearly 15,000 square feet, can accommodate 900 wedding guests seated in banquet style and 1,300 guests for a cocktail reception. Picturesque settings, outstanding cuisine and exceptional service combine to create a perfect ambiance for your cherished moments. 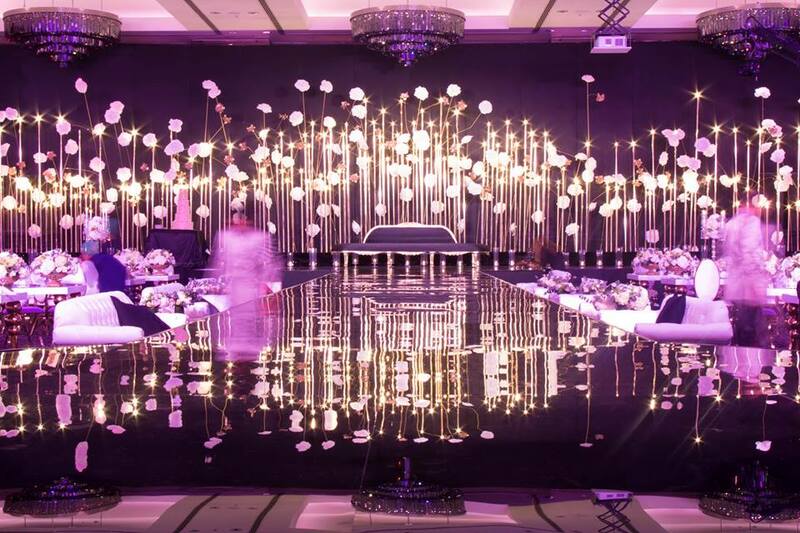 Together with Wedding Planner, Ali Bakhtiar Designs, JW Marriott Marquis Hotel Dubai will give your event a beautiful, designer feel. From their dedicated wedding boutique, located within the hotel, you can choose from a wide array of different interior and couture designs to ensure your special day is as unique as your union. The Ritz-Carlton, DIFC sets the standard for wedding hotels in Dubai. Elegance is reflected in more than 1,000 antique mirrors, artfully placed to echo your love. From its handsome limestone facade to its dramatic ballroom, this luxury wedding destination is specially designed to host every part of your celebration. Customized catering and gorgeous venues combine with flawless planning and service to bring your boldest visions to life. Samaya Ballroom seats 900 wedding guests in banquet style and 1500 guests for a cocktail reception.